Pharmaceutical Industry involves the processing of active pharmaceutical ingredients into consumable medicine for the intake of patients. These medicines are meant for human consumption as well as animal consumption so it becomes absolutely necessary to carry out a disinfection program to maintain safe hygiene. 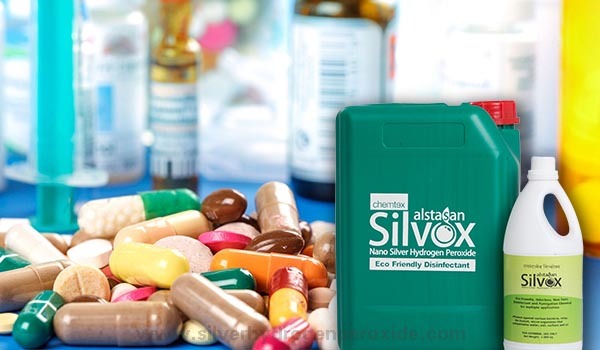 ALSTASAN SILVOX (Silver Hydrogen Peroxide based Biodegradable Disinfectant) serves as an efficient disinfectant that aids in addressing the following areas of concern involved in the manufacturing of pharmaceutical products without leaving behind any harmful/toxic effects. This potent biocide is diluted at a given concentration and fumigated using a fogging machine to disinfect a particular area involved with the processing of drug. Some common airborne microbes that may contaminate the products are Bacillus sp., Varicella sp., Influenza virus, Variola virus, Rubeola virus, etc. A recommended amount of the disinfectant is added to water, making it safe for use to be used during the preparation of medicines. Some common waterborne microbes include Entamoeba sp., Vibrio sp., Giardia sp. etc. A diluted concentration of this sanitizer can be used to spray safely on surfaces, or circulated through pipelines or conveyers for an appropriate contact time. Surfaces are more inclined towards the growth of variety of microorganisms.